Successfully Added Wireless Baby Monitor - Temperature Monitor, Night Vision, Lullabies, 2.4 Inch Screen, Two-way Audio to your Shopping Cart. Temperature sensor so you can check your baby's not too hot or cold. With its 2.4Ghz wireless connection, this baby cam and monitoring panel can be used in any room of your home. The 2.4-inch display brings you a crisp clear view of your child as they sleep so there never out of sight. With dual way audio and lullaby function, you can soothe and comfort your child to sleep if they stir in the night. The wireless connectivity of the monitor and camera make it easy to keep the monitor with you no matter what room of the house you're in and the strong signal offers enough range to span most houses without any issues or interference. The camera also has a built-in temperature monitor so you can check at a glance if their room is too hot or too cold. This camera of this baby monitor has a high-quality CMOS sensor that delivers crisp views. It also boasts 8 IR LEDs letting that provide a 3-meter night vision range so you can have a clear even in the darkest of rooms. With its 70-degree viewing angle, the camera can be set up out of reach of your baby and cover a good portion of their room and cot. 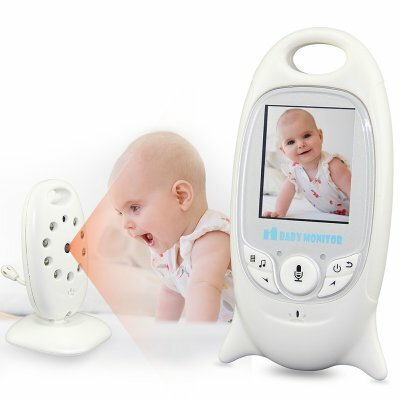 This baby monitor comes with a 12 months warranty, brought to you by the leader in electronic devices as well as wholesale electronic gadgets.